The Department of Health is finally ending its RNHEALS Program (Registered Nurse for Health Enhancement and Local Service) after four years under the leadership of Secretary Enrique Ona. 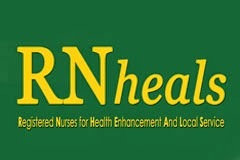 RNHEALS is a skills enhancement program of the Department where nurses are “deployed” to different DOH-retained hospitals and rural health units. In my recent visit to the Health Department, I got some few minutes with colleague and friend Director Kenneth Ronquillo who serves as the Director of Health Human Resources Development Bureau (DOH-HHRDB) and since I rarely see and meet him now, I chance to ask him several things that many nurses are asking “What is going to happen to RNHEALS?” I would like to share some highlights of our conversation to shed some light to some discussions regarding RNHEALS. What happens to RNHEALS? What made the change of program in the Department? The Department decides to end RNHEALS Program as it works slowly to hire nurses to address many public health issues and lack of health human resources in the country. With more budget coming from the Sin Taxes, the budget for employing nurses have increased in double. Before Secretary Ona would seemingly "beg" for funds for the RNHEALS Program to the DBM but this time, DOH has enough budget to implement its new program where the Department will employ nurses instead of 'deploying' them. What is the name of the new program and what is its difference from RNHEALS? The Department still has no name for its new program that will be launched next year, 2014. It is not true that the new program is "Nurses to the Barrios" Program. The new employment program though is similar to the Doctors to the Barrios Program, that is perhaps the reason why some nurses assumed "Nurses to the Barrios" as the name of this unnamed program. In the new program, DOH will hire 11,000 nurses instead of the 22,000+ nurses deployed under RNHEALS. Both programs run for a year. In RNHEALS nurses are receiving P8,000 stipend and DOH pays for their PhilHealth and GSIS contributions. But in the new Employment Program, DOH shall employed nurses similar to entry level nurses receiving Salary Grade 11 (Salary Standardization Law) or around P18,549 (Step 1) and together with all the benefits a DOH employee receives. Where are these nurses be designated? The new employment program will only hire nurses which will be stationed in rural health units and in lying-in clinics. In the new program, President Aquino questioned the rationality of hiring nurses in DOH-retained hospital where the program intends to address a wide gap in public health. The DOH then decides to only hire nurses to be employed in public health facilities only. The good news is that, because of the DOH Rationalization Plan, many DOH-retained hospitals have increased their staff. Therefore for those nurses who would like to focus in hospital/clinical service, they may apply to DOH hospitals by next year as staff nurses. Dir. Ronquillo disclosed that the DOH was approved around P1.8 Billion for health human resources in health facilities (hospitals) by next year. Can previous RNHEALS nurses apply? Will RNHEALS nurses be prioritized? Nurses who participated in RNHEALS can definitely apply for this new program since the new program is very much different from RNHEALS. DOH however said that it is the prerogative of the RHUs/Clinics whether to prioritize RNHEALS nurses. Both Dir. Ronquillo and I agreed that RNHEALS nurses have an edge in the application process since they have an experience of a DOH program. Are the applications for the new employment program now open? Although nurses may now start filing for this program, it would be best to file them once DOH has officially announced its opening. The Department of Budget & Management (DBM) is still finalizing some documents until mid-November. One of the good developments in the Department of Health is its Rationalization Plan which opens a lot of vacant positions from Top, Middle, Low Management and Rank & File positions for nurses. For those who would like to have a career within the Department, this is an opportune time to apply. Applications open in January 2014. Wittingly and jokingly Dir. Ronquillo said that "by January 2014, DOH will become an employment agency hiring thousands for many of its vacant positions." "those nurses who would like to focus in hospital/clinical service, they may apply to DOH hospitals by next year as staff nurses." I doubt if this will be possible sir because most of the hospitals nowadays will not hire you if wala kang "kapit or kakilala" na personnel sa hospital na medyo mataas taas ang posisyon. Even if the applicant is qualified, he/she wont be able to be hired without that "kapit". Most nurses are having regrets taking the course because of the type of governance the nursing administrators of hospital are doing..
yes that's true most of them have thier own backers... 90% meron kapit o kakilala but still dont be discourage to apply, meron din nmn 10% ang wlang kapit, just keep on trying and keep moving forward, just like what i did. Better give chance for those who were not employed under RNHEALS before because too much nurses are working as volunteers only. sana naman po specific ung recruitment dates and sana naman po available n ung downloadable application form. thank you so much sir! i'm very happy to read your blog.